Today, after quite an absence I decided to pick up the Hand Drill again. Since it has been a while (a couple of months), my hands and muscles weren't very conditioned. I decided to use thumb loops. Thumb loops are basically an aid to the hand drill to prevent your hands from moving down the spindle. I use very simple thumb loops by tying a loop in each end of a piece of cordage (this is Jute) and tying the cordage around the top of the spindle. You do want each loop to hang at least 6 inches , otherwise I find it restricts movement of your hands. You place each thumb through a loop and then rotate the spindle between your hands, as per usual for hand drilling, applying downward pressure as you spin. The thumb loops keep your hands in the same position. Over the last couple of years I've tried to honour the New Year with a new fire, which is a tradition dating 1000s of years. The Aztec New Fire Ceremony was a ceremony performed once every 52 years, and (apparently) a new fire would be lit through friction by the priest performing hand drill on top of the person being sacrificed! I left that bit out this year :) So on this New Year's Day after a lovely family day out , I declared on the return trip that I was going to honour the New Year with a fire and everyone was welcome to join me. The lure of sofa's and TV was far too tempting for this tired lot (it had been a late New Years Eve), so I ventured out into the back woods feeling a tad tired and nursing a hangover and I started to attempt to tease the embryonic fire out of the wood. I started with the Fire Churn (a traditional Celtic method apparently), but after a while and lots of heavy pulling it collapsed. I was already starting to feel a tad worse for wear (cold sweats etc.) at this point but I then went onto the bow drill and after several attempts and different hearth boards, and me getting more and more tired and the dark coming in, I decided to stop. So this New Year it would be a Dark Hearth. In the Aztec culture this would mean the end of the world was nigh! But nah. For me, it's not doom and gloom, but something can be learnt from this dark hearth, lessons can be learnt from the darkness! Things aren't always easy, you don't always get what you want first time, and sometimes it's just not to be and also I was alone in the wood with my family tucked up in the house, so I thought " nah this is not the way this should be done, it should be more of a communal honouring, time to go in and rest my weary bones with the clan." It's quite uncommon that I can't light a fire with friction methods so rather than struggle on or revert to modern methods I took it as a sign that this wasn't the right time, and I'm sure the right time for relighting the hearth fire will present itself in due course! An artists impression of the Force Fire method - this is of Russian Origin depicting the Slavic Sacred Live Fire ritual similar to the Celtic Tein'-éigin. image appears in the book "We Are Slavs" by Maria Semyonova. From Wikimedia Commons. "Samhain is the Gaelic \ Celtic festival seen to mark the end of the harvest season and the beginning of winter or the "darker half" of the year, celebrated from the very beginning of one Celtic day to its end, or in the modern calendar, from sunset on 31 October to sunset on 1 November, this places it about halfway between the Autumn equinox and the Winter solstice" taken from wikipedia. "The 31st is the modern calendar date for Samhuinn. In old calendar times Samhuinn would be around the 11th of November, now Martinmas. Although in reality, it would have been when the moon was dark or other calendar event such as the first frost or when the harvest was in. The date wouldn’t have been set. Banks suggest that the eve of Samhuinn was moonless and in these northern regions, dark, as befitted the “season of innumerable mystic rites” mentioned by Carmichael (which backs up the idea of a dark moon). " from Cailleachs Herbarium. Samhain is also seen as a time to remember and honour the ancestors. "Samhain is believed to have Celtic pagan origins and there is evidence it has been an important date since ancient times. Some Neolithic passage tombs in Ireland are aligned with the sunrise around the time of Samhain. It is mentioned in some of the earliest Irish literature and many important events in Irish mythology happen or begin on Samhain. It was also the time when cattle were brought back down from the summer pastures and when livestock were slaughtered for the winter." taken from wikipedia. Fires were traditionally lit at Samhain (and Beltane) and it is thought that all other fires were extinguished and people lit their hearth fires from the new “pure” fire . There would be much symbology attached to this - to mark the passing into Winter, to burn the old away and welcome the new etc. The traditional Force Fire method was using a large “fire churn” apparatus employing friction fire. You can see my re-construction in this Youtube clip. Force Fire \ Neid Fire was also used at times of distress to cure ills as well as for rituals such as Samhain and Beltane. Another of my fire churns, this one was used at the Erti Suli gathering in May 2018 as part of a ceremony. The children pulled the ropes and it worked beautifully! As can be seen from the picture to the left, a frame is constructed from timber to support a bearing bar. A large hearth log would be placed at the base with a shallow hole carved in and with a notch (similar to bow drill hearths but on a larger scalel!) A straight log about 6 feet tall (I'm using a smaller one), and about a foot in diameter would be used as the spindle, sometimes referred to as the auger in older writings, would be carved at each end with a narrow point at the top and a more shallower point at the bottom but you wouldn't want the bottom to be too wide as otherwise it may be quite difficult to gain enough friction to produce an ember. The auger\spindle would be placed vertically between the cross bar and hearth . The auger needs to be carved as straight as possible and be placed as vertical as possible. ​​ A long heavy rope would be tightly wrapped several times around the middle of the auger (it would help to carve a narrower section in the middle so the rope doesn’t move up or down the auger) with an end of the rope on opposite sides and this would be pulled with force and speed in turns by a group at each end of the rope to create friction. The rope would need to be kept tight at all times. The weight of the large auger and heavy cross-bar produce enough downward pressure needed to create the friction, for extra pressure weights could be added to the cross bar. As the auger reduces in height due to friction the cross bar would need to be pulled downwards. Making a full size Force Fire churn requires much effort and time, and operating a Fire Churn involves many people to pull on the ropes to produce an ember and especially with Oak, but ritual is not about speed or efficiency and theatrics does have it's place in ritual! And actually, these devices work beautifully well. According to some folklore nine nines of first begotten son’s were required to pull the rope to “churn” the auger into the hearth log! If you wish to light your fire in a ritual way, I would suggest to try a friction method (e.g. bow drill) and try not using modern lighters\fire lighters (unless necessary) and to try to do it with intention and awareness. See the page Sacred Fire for more information on suggestions of welcoming fire in a sacred and ritual way. Descriptions I’ve read say that this method, produced fierce sparks and “forced” a fire, but I feel this is an over dramatization (Oak doesn’t have the properties to burst into flame in this way!) but there would have been much smoke ( and in reality it would hopefully have created a very large ember which could then be used to light the new pure fire. Once lit ,the pure fire would be kept going until the end of the ritual. Other fires in prominent places may also have been lit from this fire, and people would then light their home hearth fire from the "pure" fire. Some people may question whether Oak was used, but I have proved that Oak does work with the bow drill. The Force Fire apparatus was also used throughout Europe and Russia by the Celts and Slavs. More information can be found on my Fire Churn page here. The Oldest Surviving Evidence of Friction Fire? Oh this is good... I think this may be the oldest surviving evidence of friction fire. Apparently a 6000 year old wooden Fire Drill was discovered in Canada (Triquet Island , BC) in 2016. Click here for an article in The Vancouver Sun which is showing a photograph of the ancient spindle, but it is lacking information which is surprising as this is quite a find! For me , this is fascinating - the oldest fire drills I am aware of are from China (approx 4500 yo) and Egypt (approx 4000 yo). There is this paper I have found by Alisha Gauvreau and Dr Duncan McLaren from the Anthropology Department, University of Victoria (B.C) working on the Hakai Ancient Landscapes Archaeology Project - which states that the "Fire Drill" was found in the peat layer which is between 6,726 and 6,674 years old but that's it! I'm surprised there isn't more information on it as it is an amazing find! I'm trying to find archaeological reports for the Triquet Fire Drill but I've not found any yet .... but I'm enquiring with the Hakai Institute - watch this space! Has there been carbon dating on the fire drill? What species of wood is the drill? Is their evidence that it is a fire drill e.g. charring at the end ? From the photograph it looks like it is approx 10inches in length, and it is tapered which seems quite odd for a Hand Drill - it is 6000 years old so it could just be a fragment of a larger piece and some rotting may have taken place. To me, it does look like it could be a bow drill spindle (but that's just me guessing!) - knowing the species of wood would help. The Ancient Triquet Village is one of the oldest settlements discovered in North America (approx 14000 years old) and I found this statement fascinating “It appears we had people sitting in one area making stone tools beside evidence of a fire pit, what we are calling a bean-shaped hearth” (Alisha Gauvreau) .. re-affirming the fire being central to human activity. The other amazing thing about this is that the team based their search on oral stories passed down through generations that this Island had been populated during the Ice Age which alot of people discounted. Autumn is here! A great time to get out in nature and harvest materials for friction fire! I've also found that I'm always on the lookout for materials, and sometimes I find them in unexpected places such as car parks. So even if you live in a city, you'll be surprised at what you can find in often unusual places. I am lucky to live near to amazing open green spaces that have diverse habitats including woodland, meadows, rivers, and ponds, which provide me with everything I need. Unfortunately this year, 2018, Bristol Council have started being more brutal in cutting vegetation back so I'm having to hunt out certain materials including Rosebay! ​Where possible I prefer to use materials native and local to where I am. Please do forage with responsibility and put nature before your needs! 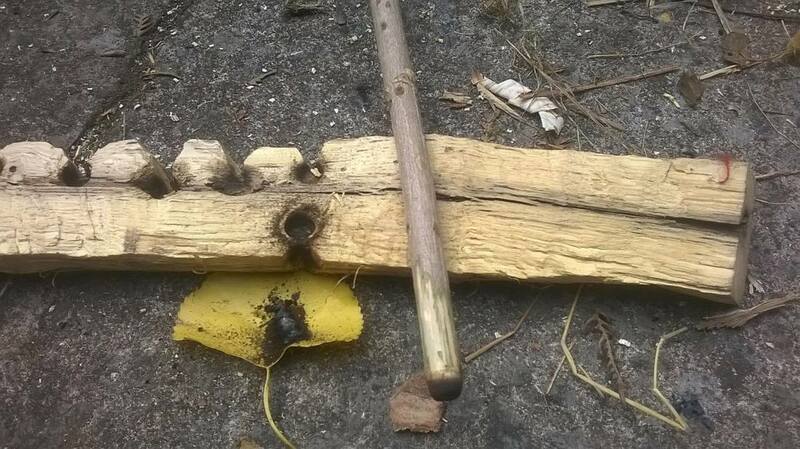 It is best to collect dead standing\fallen wood as this is best for friction fire rather than cut green wood. If you need to cut green wood (e.g. Elder spindles) try to only cut a couple from one tree, use a diagonal clean cut (do not snap) and don't cut flush to the branch it is sprouting from. For plants (e.g. 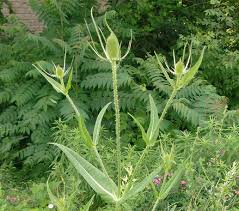 teasel and mullein) you'll need to wait until Autumn once they have seeded before you can cut (they won't season like wood anyway) and if they still have seeds then shake them to scatter the seeds and cut the seed heads off in situ. It's always wise to use discretion (especially in public places) and don't take too much at a time. Hazel &Willow - there is lots and lots of hazel in my local woods, and it tends to grows straight this so this is what I commonly use. Ivy - Ivy tends to soaks up moisture\water (even when dead) so it is best to strip the bark and carve into boards first then dry and store for future use, otherwise it tends to rot. Hazel, Lime, Willow, Poplar (to name a few) - again if you carve into boards first, then they will dry out quicker. It is best to select the straightest possible rather then trying to straighten out. If they are still a little wonky then straighten and tie to a broom handle, using elastic bands etc, while still green and drying. Cat tail (bulrush) , broad leaved Dock, Ragwort, Burdock - I haven't tried these yet. Again, collect these, once they've started dying off. Wild Clematis (Clematis Vitalba\Old Man's Beard\Traveller's Joy) - wild clematis looks like Tarzan vines hanging from the trees. 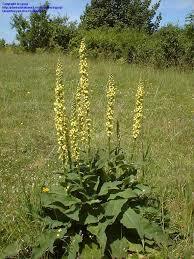 It can be quite difficult to find in some parts of the country, but is quite prevalent in the South of England. Like Ivy, it's best to carve into hearthboards then dry and store. ​Note: Ivy and Clematis don't have a grain so they don't split well so it's best to carve. Tinder - most tinder materials are best collected dead and dry it out. Rosebay Willowherb seed heads are fantastic for tinder, for extending the ember. Willowherb tends to be very common in the UK and starts seeding in mid to late Summer - collect the fluffy seed heads and throngs. Try to find Rosebay rather than other types of Willowherb as it's easier to collect Rosebay seed heads as they all grow at the top of the plant. Thistle seed heads (very common!) - again for lining tinder nests. Thistles start to seed in mid to late summer. Dead dry grass - loads of it in meadows (as long as your council haven't cut early!) You need to collect it dead yellow, rather than green. 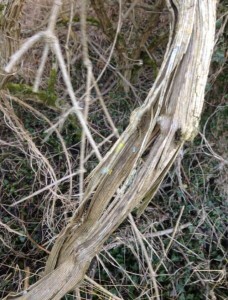 Clematis bark - collect the bark which is falling off the vine and you need to buff it up and separate it out for the tinder next. It works really well. 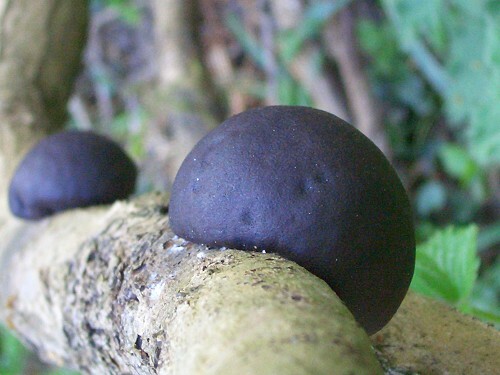 King Alfred Cakes fungus (grows on dead ash) - you need to collect these when they are black (dead), not brown (alive.) These act like coals and you only need a small spark\ember to light one so useful to have a couple of these, just in case. You can then place your tinder ontop of the fungus, and blow on it. Bracken - One of my favourite tinder materials is bracken and it's best to collect it when it's died off in late Autumn. I collect sack fulls (but only where it's plentiful.) Snap the bracken - don't pull out by the root as it propagates from the rhizomes (roots). Wear gloves as dead bracken can rip your hands to shreds! Collect the stalks and leaves, as it all burns very well. Stinging Nettles - Wait until late Summer\early Autumn when the Nettles are at their tallest, and wear gloves! Again cut the nettle at the base of the stalk, rather than pulling out. Willow and Lime bark - I've not collected or tried this yet. One for the to do list. Jon's Bushcraft has good articles on collecting and processing Nettles, Willow and Lime for cordage. Store everything away dry and in a dry place. And keep those eyes peeled, it's amazing where you can find materials! Caution-Ticks! Also be aware of ticks (which can pass on Lymes disease.) If you are in places frequented by Deer (especially if in long grass \ bracken) then check yourselves thoroughly (and best to wear long socks, long sleeves, trousers etc) and use Tick removal tools to remove any as soon as possible. Bow Drill with Natural Cordage - dispelling the myths! ​I am passionate about natural cordage and I feel that too much synthetic cordage is used within modern bushcraft for the bowdrill. Personally, I feel it is a bit of a cheat and you may as well use a lighter! (shock horror!) This clip talks about natural cord alternatives and demonstrates 3 different ways of using 3 different types of natural cordage, and shows that it isn't that difficult at all. I hope this encourages at least 1 person to switch! The hand drill , is the method I find the most profound , and more akin to a spiritual practice, as it is just you and your hands welcoming in the fire. It's also one I have had a love and hate relationship with, though I do seem to be starting to relax more with it. I decided to pick it up again last week after having a break for a few months and I happily discovered that I was able to welcome an ember using a slightly different technique. I used a longer spindle and knelt rather than sat, and used a piece of wood to weigh down the hearth board to stop it from moving and after only a little while I was blessed with an ember. And a few days later , I was successful again so this way does seem to be better for me - you can apply more downward pressure but it does need a longer spindle. The woods used were Elder spindle and Clematis hearthboard. I also leave the bark on the spindle (except for the bottom) as I find it helps with grip. My latest fire churn - this one installed in the back garden! …and as fire destroyed , it also cleared the way for new growth, and some species actually depend on fire for their survival…. Our distant ancestors lived amongst the wild fires, and over the millennia this connection with fire evolved and deepened. Initially it may have been base instincts and emotions like wild animals but over time as our ancestors evolved so did the connection with fire. I find it hard to imagine what life would be like without fire - we wouldn't have most of what we take for granted today without fire.No one can ever know what happened or over how long a time period, but in some way or other our ancestors realised fire made you warm, it kept wild animals away, and that cooked food tasted a lot better than raw food and so the story of our evolution began! And so our distant ancestors learnt to tame the wild fire, it changed EVERYTHING! And so I like to say that we are forged from fire! once we had controlled fire, we guarded it, we had to keep it going as once it went out we couldn’t find it again until the next natural lightning bolt or lava flow …. or we stole it, or fought for it from others …. Can you imagine the status afforded from having fire…. The wild fire was tamed…. Contained in the hearth fire…. The hearth fire became central, a focus, offering protection, warmth, light…. And, Over time we would have learnt to transport it , which enabled us to roam more, not be constrained to one place without losing the precious gift of fire…. Homo Sapiens would not have evolved without Homo Erectus taming the wild fire. as we didn't need to process raw food our jaws and teeth became smaller and since we needed less intestines to digest food our torso became thinner. So our species would not have evolved, and would not have developed and advanced without fire. Our ancestors learnt to “make” fire ….. So we learnt to make fire…. By striking flint onto rocks rich in iron deposits … a tiny spark would appear… these sparks are not as hot and don’t travel as far as those struck from flint on steel…..
though most stories and folklore relate to fire by friction rather than percussion…. and so saw the transition from hunter gatherer to farmer …the Neolithic period began in Britain…. with the help of fire, trees were cleared to make way for crops… and they honoured fire and worshipped fire…. The onto 3000 BC ish (only 5000 years ago) to the discovery of smelting metal from rock from ore through extreme heat of fire and wow how things rapidly started to heat up then with the Bronze Age… woodland started to be managed and coppiced so there was a steady supply of charcoal to feed the forges…. the fire steel was then invented and the main method was then striking flint on steel (which continued on until 19th century! )… and the deep connection with fire was starting to fade…. but not entirely, not in ritual …. there is old language and old stories about fire by Friction, and it seems it was commonly used within ritual, in many cultures as it was still seen to be magical…..
… and then in the early 19th century ….the last Neid fires burnt out for the last time in the highlands of Scotland and throughout Europe………. Did people gasp in amazement, was it magical, was it amazing, or was it just taken as granted…. and again whoosh we have instant fire…. A commodity even…..
Do we gasp in amazement each time we work a lighter…..
in each flame, do we revere in the million years of ancestral memory ?? The deep connection and mysticism of fire pretty much a distant memory for most…..
our connections with the world, nature, each other, the mysticism of life, diminishing…..
amongst all of this, indigenous peoples cling on, cling on to their ancestral memory, still welcoming fire using the old ways of fire by friction…. in the Celtic tradition, at Beltaine and Samhain, they would extinguish all fires and light a new pure fire (also Neid Fire) through friction of wood using a fire churn, a fire machine…. They would then walk the livestock through the smoke back into the pastures and all community fires would be relit from this new fire, a new fire symbolising a new phase of the year, new life, new growth….. this all but disappeared in the 19th century, the church banning the Neid fires, however in Russia a similar practice Sacred Live Fire can still be found today used by pagan groups here and there…. and today In our modern world…. The Olympic flame is still lit several months before the opening ceremony of the Olympic Games at the site of the ancient Olympics in Olympia, Greece. Eleven women, representing the Vestal Virgins, perform a celebration at the Temple of Hera in which the first torch of the Olympic Torch Relay is kindled by the light of the Sun by a parabolic mirror. wood stoves have made a come back, people wanting the fire visible in their home….the hearth fire…. the faint ancestral memory is there in us…. and for me, like many traditions before me , and as can be seen by the many stories, fire by friction is …. holy, special, spiritual, it’s more than just a way to make fire, you could say it’s magical….. and so I am welcoming the fire through the friction of wood…..
and behind me there is a million years of ancestral memory and billions of years of everything coming together into the one moment of welcoming the fire …. the ancestral fire, our creator, our ancestral memory, our future, our very survival. The Fire Churn.... it works beautifully! The Majestic 6 foot Fire Churn installed at the Erti Suli Gathering (at the start of May.) It worked beautifully, even better than I had ever envisaged with no practice runs! The many hours of researching, dreaming into it, finding the materials, preparing the materials and building and experimenting paid off! I was very very pleased with its inaugural churning. It was used as part of a ceremony so there are no photos or videos but maybe stories will be told :) It was a dozen or so children who enthusiastically pulled on each end of the rope to welcome the embryonic fire out of the mother hearth. We then collectively breathed into the ember to welcome the new pure fire! Despite its size, it worked beautifully. This is an authentic honouring way to communally welcome in the ancestral fire, based on an old way which ceased 200 years ago-ish; used in times of distress and at auspicious times such as Beltane and Samhain. Read more about the fire churns here. For those interested in the practicalities, the 6foot spindle is made of an Ash tree trunk and the hearth is Hazel; the bearing log is Holly; 20meters of 12mm sisal rope was wrapped around multiple times. A piece of bark was used for the tinder tray. The Ash shavings created from making the spindle were used as the tinder. Oh and the ember was jubilantly huge!